With the recent invention of hoverboards, all kinds of unique spins have been made. Brands have mass-produced better wheels, a more stable board, and fixed mechanical errors that initially damaged the reputation of the hoverboard. Although those errors were quickly fixed, consumers began immediately requesting upgrades.When they were first released, hoverboards were a thing of the future. Everyone wanted to get their hands (and feet) on one. They allow you to glide around without having to walk, so who wouldn’t want one? It’s not the easiest activity to get used to, but that almost added some ‘coolness’ to hoverboarding. In order to be an expert, you had to put in some work. However, for beginners and people who didn’t have a lot of time to spend on hoverboarding, it was a little frustrating. The lack of stability made it harder to balance, but that’s where the Swagtron T6 Off-Road Hoverboard came in to fix those issues. The T6 is as easy as it gets with hoverboarding. With a balancing system, huge tires, and off-road capabilities, the Swagtron T6 is one of the smoothest rides you’ll find on a hoverboard. Instead of being limited to streets and sidewalks, you can now ride around on grass, dirt, down steps, and through gravel. It’s pretty impressive to see the massive leaps and bounds that Swagtron made with the T6. Not only did Swagtron allow for off-road capabilities, but they also increased the weight limit, the motor size, the battery efficiency, and much more. Almost every issue that hoverboards had in the early stages was fixed with the Swagtron T6, which makes it one of the best hoverboards around. 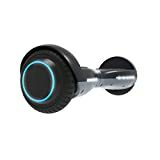 It also doesn’t hurt that they added a-rockin’ Bluetooth speaker to give you the choice of which tools you want to jam out to while riding around! The special wheels on the Swagtron T6 help it go wherever you want to go. Not just streets and sidewalks, but you can literally go over almost any terrain! Dirt, mud, grass, gravel, nothing will present a challenge to you when you’re riding one of these hoverboards. In the past, everything other than the asphalt and the sidewalk was off limits. Now, you have no boundaries! Another great off-road feature is the fact that you can go down steps. How limiting is it to know that you can’t ride a hoverboard anywhere where there are stairs? Especially in larger cities, it’s simply impossible to get around. 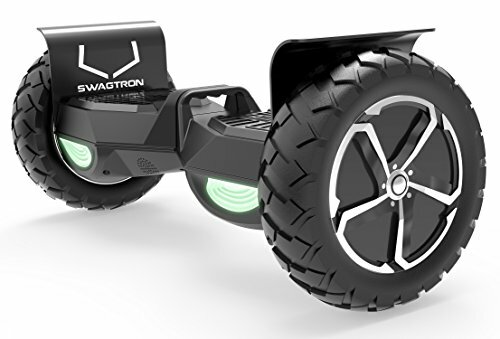 With the massive rubber air-filled tires of the Swagtron T6, you can go downstairs without an issue at all. Hills were also a problem with many hoverboards of the past. Again, Swagtron conquered the problem and now their T6 model is capable of climbing 30 degree angled hills. That’s pretty steep! It would be pretty exhausting to have to walk all the way up, but now with a simple lean forward, you can be to the top in a matter of seconds. Another huge advancement that Swagtron made with this model is the motor and the battery. Where most motors aren’t powerful enough to pull over 200 pounds, this one eclipses those limitations with a 420-pound limit. 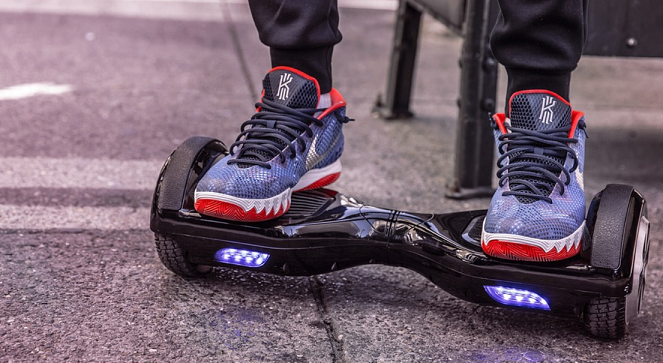 It’s a huge advancement because now millions of more people are able to ride these hoverboards. They’re now capable of carrying most of the world’s population. The battery life on the T6 hoverboard is also a fantastic feature. It goes up to 12 miles before it needs a recharge, which is pretty rare in the industry. When hoverboards first came out, they last no more than two or three miles before fizzling out and needed to be recharged. Not only does this mean more fun for you, but it also makes these hoverboards much more likely to be used as transportation. Curious about the speed? This 300-watt dual motor allows you to cruise up to 12 miles per hour. That’s pretty quick considering hoverboards used to be limited to about eight miles per hour. It might seem like a small advancement, but four miles over the course of just one hour is a significant difference for traveling around the city. Remember how we said there’s a self-balancing system? It might just be the single best features on this hoverboard. The T6 stabilizes itself and allows you to steer it wherever you want without letting you fall. This is groundbreaking technology for hoverboards because they used to have zero self-stabilization. When they first came out, you’d rely 100% on your own balance, which isn’t the easiest thing to do when you’re moving eight to 12 miles per hour. Another awesome feature is the fact that the T6 comes with an onboard Bluetooth speaker. You can play your favorite tunes while driving around town on the coolest looking off-road hoverboard around! Honestly, we can’t think of a better way to enjoy your time than using a Bluetooth off-road hoverboard in your off-time. + The Swagtron T6 is an off-road hoverboard that allows you to go over any terrain in your way. This includes gravel, dirt, mud, grass, and finally stairs! Stairs have always been the bane of skateboards, hoverboards, scooters, and more. Finally, action sports can see a solution to the ongoing problem. + The dramatically higher weight limit on the T6 makes it available to millions of more potential hoverboard riders. Previous limitations capped off around 200 pounds, which cut out far too many people. Now that the limit is set at 420 pounds, pretty much everyone can enjoy the off-road features of the T6. + The built-in Bluetooth speaker on the Swagtron T6 makes this ride all the better. Why? Because it’s so much more relaxing and enjoyable to listen to your favorite toons on your way to work, school, or the store. Everyone loves jamming out to music, so it’s the perfect addition to this model. + Lasting up to 12 miles, the Swagtron T6 will have no problem bringing you to and from the place you’re headed. Unlike many pre-existing brands that refuse to raise their limitations, Swagtron is always trying to better their next models. – To some people, 12 miles per hour might seem a little slow considering some electric skateboards go up to 30 miles per hour and beyond. However, hoverboards require much more balance, and therefore it would be unwise to go much faster than around 15 miles per hour on them anyways. – While going downstairs is no problem, going upstairs still presents a challenge. While it’s still possible, it’s much more difficult and labor intensive to go upstairs, which makes it more efficient to simply carry the hoverboard until you’re at the top of the stairs. That being said, it still goes uphill without an issue. The Swagtron T6 is suitable for all kinds of users. It’s great for getting you from place to place without sending off-gas emissions, and it’s simply fun to use. While most people use them just to show off to friends and family, hoverboards are becoming more and more popular as a form of transportation. Obviously, their previous mileage and weight limitations really hindered their ability to become anything more than a small source of fun. However, the T6 is all geared out to be an actual reliable way to get around. It’s also really fun to do tricks on. Any action sports equipment is always going to be used for different tricks to have a blast with, and the T6 is no different. The only difference is that most other action sports items can’t be used off-road as this one can. You can do 360-degree spins, bunny hops, and more. We loved the Swagtron T6 Hoverboard because it crushed so many doubts and fixed all the problems of previous models. Weight limitations were always an issue, with 200 pounds not being near enough. Swagtron answered this problem with a new 420-pound weight limit, over double the previous capacity. Another issue was the fact that hoverboards were limited to streets and sidewalks. 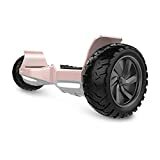 Again, Swagtron took to fixing this issue by adding a slightly larger motor and off-road tires to go over and around any terrain in your path. There’s no dirt path or grass patch that you can’t go over with the T6. Another huge issue with hoverboards that almost ruined them as a whole was the fact that balancing was far too difficult. Once more, Swagtron fixed the problem by adding a self-balancing system that took away 90% of the job and gave you the control to dictate where you go without falling or tripping. 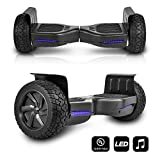 The way that Swagtron took on all the obstacles that were glaring at the hoverboard industry and fixed literally all of them with the T6 makes this model one of the most sought-after hoverboards around. It’s hard not to enjoy such a great work of art that truly helped save and reshape a quickly dying action sport’s vehicle.